MORGANTOWN, W.Va. – WVU Medicine Obstetrics and Gynecology has experienced remarkable growth over the last two years. By increasing its team of gynecologic oncologists and adding a nurse practitioner, physician assistant, and genetic counselor, the department has expanded its capability to serve gynecologic cancer patients. Standing, left to right: Valerie Galvan Turner, M.D., gynecologic oncologist, Krista Pfaendler, M.D., gynecologic oncologist. Seated, left to right: Holly Shapiro, A.P.R.N., and Brittany Sebben, P.A.-C. Not pictured: Mohammad Ashraf, M.D., gynecologic oncologist. 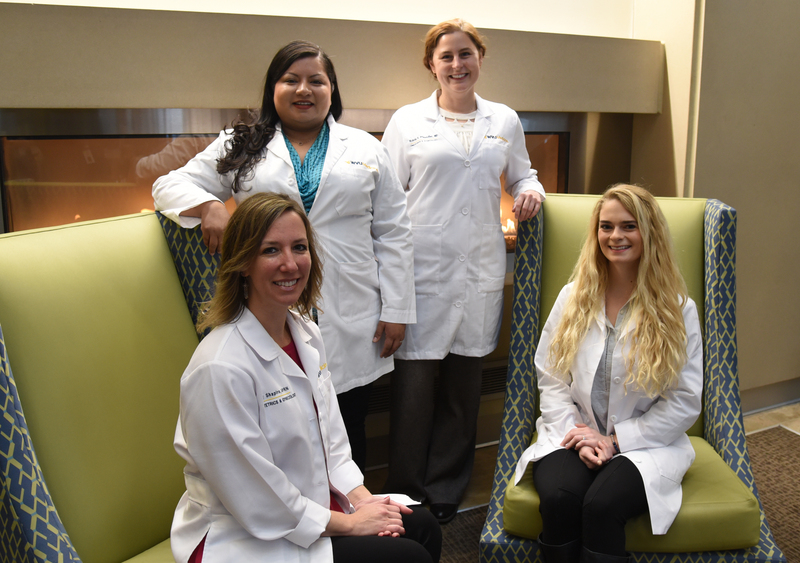 The team of physicians at WVU Medicine, which includes Valerie Galvan Turner, M.D., and Krista Pfaendler, M.D., two of the three female gynecologic oncologists in the state, and Mohammed Ashraf, M.D., is the largest gynecologic oncology team in the state. Drs. Pfaendler and Galvan Turner offer robotic surgery. These advanced techniques allow patients to have a faster recovery after complicated cancer surgeries. In addition to the gynecologic oncologists, a genetic counselor was added to the staff to help patients make informed decisions about their treatment plan based on their inherited risk. The team has made changes in the way patients receive care with the adoption of enhanced recovery after surgery, or ERAS. This method allows patients to drink up to two hours before surgery and eat and walk immediately after surgery, often decreasing the amount of time the patient has to stay in the hospital.